JINXED—-considering the reviews, the boxoffice, and the way its two stars did not get along, certainly was given an appropriate title. It’s a watchable flick, not all that awful, just unfinished, jumping back & forth between serious and slaphappy without much attention to continuity or believability. 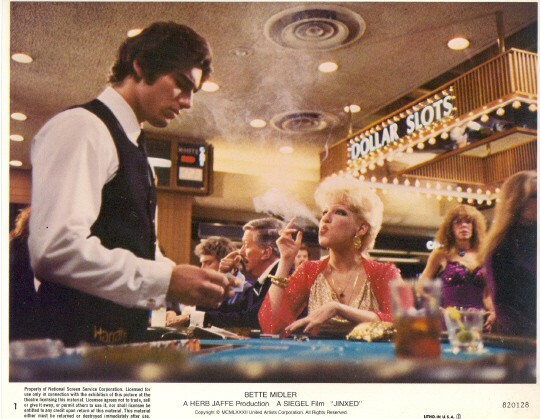 Ken Wahl plays a blackjack dealer who is pursued and seemingly jinxed by Rip Torn, a ‘subsistence gambler’ who has targeted this young fellow as his personal pigeon to psych-out and pay-off. Bette Midler is Torn’s abused girlfriend: she becomes involved with the mark. Part of what sabotages the movie is that director Don Siegel doesn’t seem to have much of a touch for light material, having specialized in rough, well-done action pix. So the most effective sequences in the film are the most unpleasant as well, keyed by the excellent work from Mr.Torn. The script tosses Midler and Wahl together so quickly and arbitrarily that their pairing has barely an ounce of depth, to say nothing of chemistry, which only seems honest in scenes where they’re giving each other a bad time (they despised each other). 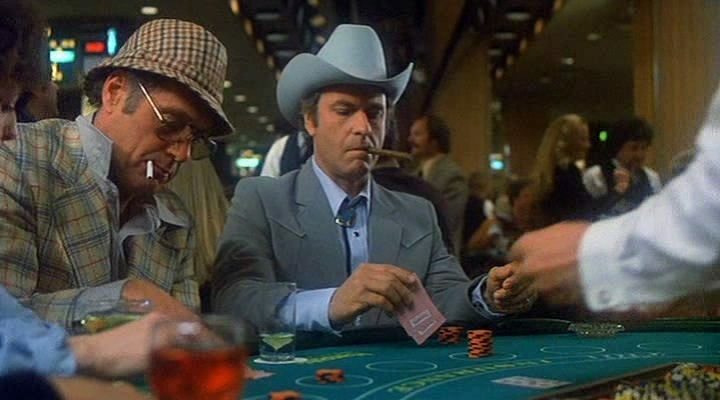 Siegel had a heart attack during production, and Sam Peckinpah handled some chores–sounds like a happy set all round. The supporting actors are all able, but none do more than put in an appearance: Benson Fong’s the quickest, Jack Elam’s the weirdest. Shot by Vilmos Zsigmond, it’s nice to look at in Lake Tahoe and Reno locations. Wahl is not bad, and Bette gives it her customary verve, her fans will approve: it’s just odd that the lady who was so brilliant in The Rose and the guy who helped make The Wanderers rock should follow those scores with such an uneven, forgettable time-filler. From 1982, running 104 minutes, with participation from Val Avery, Woodrow Parfrey, Ian Wolfe and Joan Freeman. Bombed big time, making less than three million against a cost of thirteen.